We're in discussion about how Maersk and Shell stuff fit, so there may be a different ruling on that shortly. We'll get back to you. In the short term, I've removed my original statement. We're revisiting some of these rulings to see where they fit on licensed things. We'll get back to you. Also edited a few of the replies to keep it from being confusing. Ahh, thanks, I did read that before and forgot. So what I'm seeing with the background editing is, removing the actual background and replacing it with a basic single-color or gradiented background would be okay, but putting the vehicle on the sands of Tattooine is not okay. meeotch wrote: Ahh, thanks, I did read that before and forgot. So what I'm seeing with the background editing is, removing the actual background and replacing it with a basic single-color or gradiented background would be okay, but putting the vehicle on the sands of Tattooine is not okay. alright, here's the final word. - Your task is to build any non-Star Wars, licensed podracer. Take any of LEGO's official licensed lines past, present and future and build a podracer. Imagine what a Buzz Lightyear Star Command Podracer would look like. Or a Batpodracer. How about a Winnie the Pooh Honey Potracer? You get the idea yet? The only exception to the licensed line rule is, of course, Power Miners. Power Miners podracers will be accepted. No Star Wars podracers; you will be turned away at the gate. - Podracer must be in minifigure scale. - Pilot must be seated in the cockpit pod and visible in at least one of the two photos submitted. Master_M39 wrote: What about Atlantis? Atlantis is not a license! It is an original Lego theme. If it's not on the above list, it's not allowed. the op has been updated with the above clarifications. Would the architecture series be a license because they are models of real life buildings, such as the Space Needle and the Empire State building? also, i wanted to make a point of something. 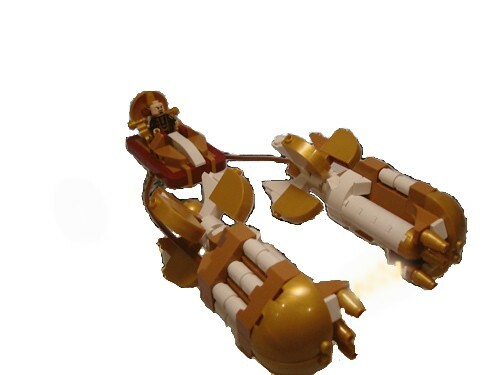 Just because one theme was only released in Duplo, such as Mickey Mouse, Dora The Explorer, that doesn't mean that the podracer has to be made out of duplo bricks. onions wrote: - Pilot must be seated in the cockpit pod and visible in at least one of the two photos submitted. Unless the Podracer is its own pilot, right? I.E. My Toy Story RC-pod idea? onions wrote: if you removing backgrounds on your image, choose a plain white or some other solid or gradient colored background. 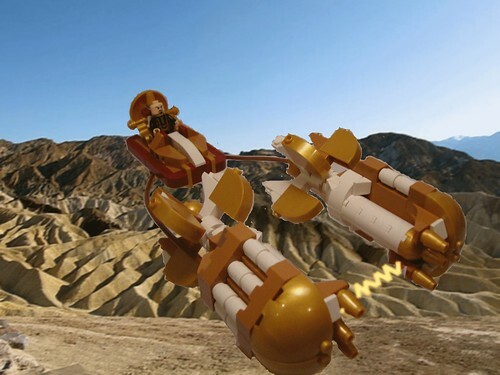 if you superimpose your podracer on the sands of tatooine, you are adding an image, thus disqualifying yourself. RC would have to be the pilot. i know what you're trying to do, you're trying to make RC into the podracer. it's not going to fly. it needs a pilot. Lovely to see this concept endure for another year! Though you've left a theme off your list - Jurassic Park III. Also on the list of potentially missed licenses, what about Vestas? I have all these wonderful ideas involving wind turbines and podracers, you know!